Strasbourg’s first new cross-border Citadis tram is set to begin dynamic testing after being delivered by Alstom. Operator Compagnie des Transports Strasbourgeois (CTS) signed a framework for 50 trams in 2014 – 12 of these were ordered at the time. On-track testing is now due to begin. The remaining 11 units will be delivered by May 2017. Commercial services a due to start in April. The 45-metre long trams will complement the existing Citadis fleet in Strasbourg, operating on lines A and D, including the extension to Kehl in Germany, which will make it France’s first cross-border tram service. The cross-border connection means the trams have had to comply with Germany’s BOStrab regulations for light rail vehicles. 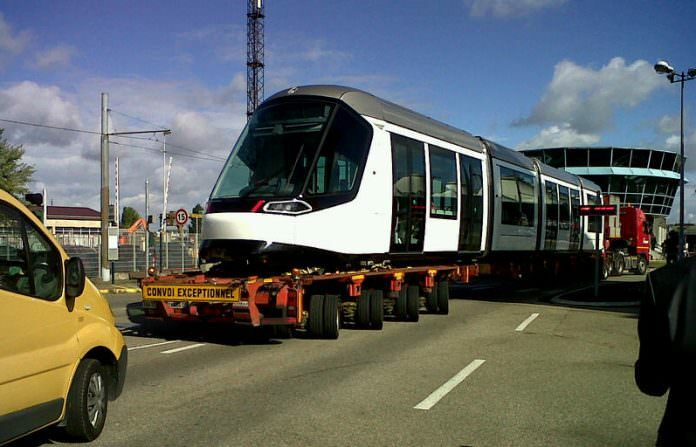 “France’s first cross-border tram service” – no way. The Saarbrücken network extends to Sarreguemines in France. The Basel network includes a route that crosses into France and back again. Originally built as a normal line, this was converted to trams in the 1980’s. Historically, both Basel and Geneva had multiple routes extending into France. The Saarbruecken tram network is based in Germany, with a small segment extending into France. The Basel tram network is based in Switzerland, with short segments that cross into France and Germany. Therefore, yes, the Strasbourg network will be “France’s first cross-border tram service” – the first tram service based in France that will cross a border (in this case, to serve a short extension into Germany).